We left Seattle just before 1pm the day after the U2 show in Seattle and after 800 miles we were in Oakland 2 days later. The first day we drove to Eugene, Oregon and spent the night at a Motel 6. 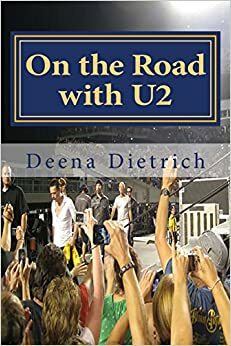 It was the first time on my trip that I drove to another city the day after the U2 show, and I was exhausted – even though I only drove 5 hours. It was also the first time I drove and it didn’t rain. The second day was Cilla’s 4th birthday, which she spent in the back of the car for 9 hours. We left Eugene just before 9am and arrived at La Quinta hotel in Oakland just after 6pm, stopping 3 times along the way. I was in such a good mood on the drive. I’m not sure if it was a good night’s sleep or the memory of Larry’s smile walking toward me at the end of the Seattle show that kept me happily on my way. Even the guy at the California inspection was in a good mood that day. He was a U2 fan. He said the U2 trucks came through a few days ago on their way to Oakland. I was really happy I was going to be in California for the next 13 days. I really loved traveling out west, especially the west coast – definitely my favorite part of my trip. What I didn’t like was having to backtrack routes. I drove north on route 5 from Reno to Portland, and then drove south on route 5 from Seattle to Oakland. But that was nothing compared to July when I would go back and forth across the Ohio and PA turnpikes over and over. In Oakland I noticed that in addition to this being my U2 360 tour, this was also my tuna and pizza tour. I pretty much lived on tuna and pizza the entire 3 months – and sweet tea and sun chips. I had the best tuna melt I’ve ever had at the Hotel VQ in Denver, had an ok tuna melt at Carrow’s in Reno, and a great tuna salad sandwich at Pike Place Market in Seattle. In addition, I’ve had tuna subs from various Subways along the way. I had a yummy pizza in Kansas City my first night on the road. I had pizza from the hotel restaurants at the Ramada Reno, Vintage Plaza Portland, and Monaco Seattle. The best of these was the margherita pizza in Portland. I also had domino’s pizza in Eugene last night because I was too tired to look for anything else. 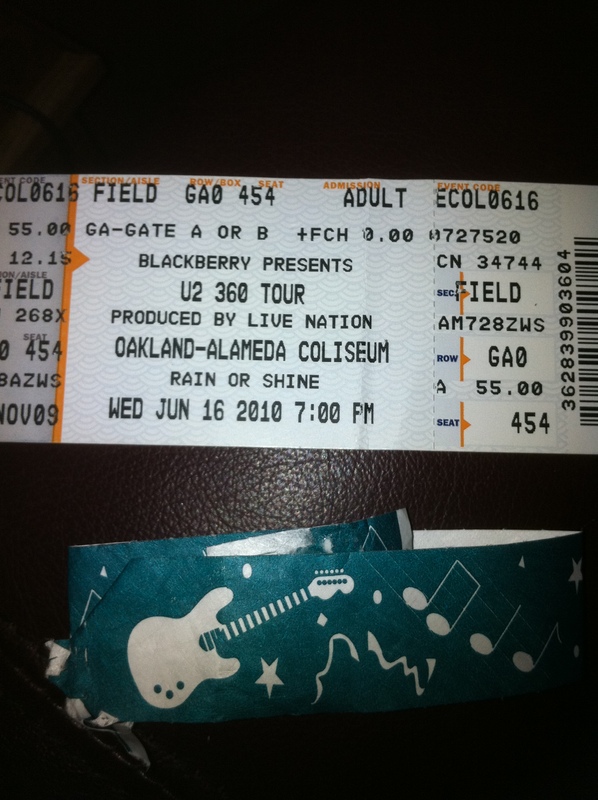 The U2 360 show in Oakland had the same set list as the previous three shows in the US, but was a little different. First, the baseball infield was fenced off, so the GA area was smaller – as was the inner circle behind the stage. Second, there were two opening bands, so U2 didn’t come on until 9:30. Third, and most important to me, Larry sang!!! I spent the first half of the day resting in my hotel room to conserve energy for the show, as I did before every show. My routine was stay in bed reading and watching tv until about 1, take Elvis and Cilla out, eat and shower, and then head over to the stadium around 2 or 3. I would wait out for U2 to arrive, then go into the show. Even though my hotel was less than a mile from McAfee Coliseum, I took the free hotel shuttle over to the Coliseum just after 2:00. 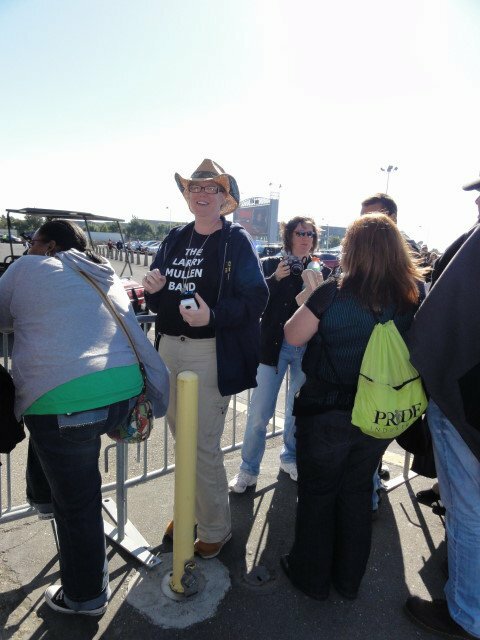 I walked around the stadium and arena and finally found my friends, Matt, Melissa and Kim waiting for U2 to arrive. Barb found us and then I met Paula, who brought me a cool pin and later sent me the review from the Oakland paper and pictures she took at the show. Bono arrived just after 5pm, stopped the car right in front of us and hopped out. As soon as Bono got out of the car, I pointed at him and then at my ‘Larry Mullen Band’ shirt and said, “Now Bono…” He put his hands in the air and said, “I tried.” Then he walked right over to us, and I said, “So he’s not coming (referring to Larry)?” Bono said, “I tried.” While he was signing autographs, I told him that it’s ok because I’ll be at other shows. 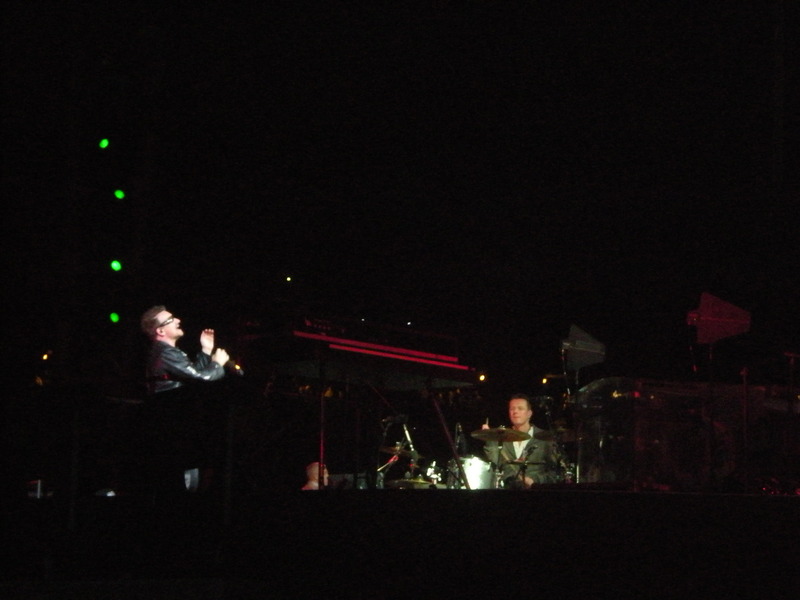 Bono asked me, “What is your name, Deah?” I said, “Deena.” He said, “Yes, I remember.” He went on to talk to others. 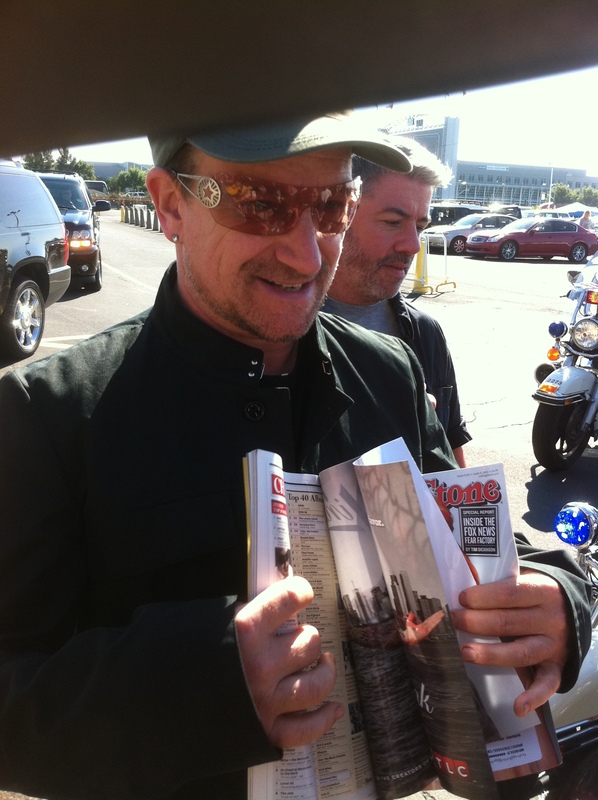 Bono looked tired, his voice was scratchy, and he said he was sick. Before he got back into the car to go inside, Bono looked over to me and shouted, “I’ll try again.” It was in Oakland that I realized my quest on the 360 tour, besides driving to every US show, was to meet Larry. I thought it would be easy, since Bono had come out to greet the fans the first four US shows and I had already talked with him twice about meeting Larry. Little did I know that was my last chance to speak with Bono. 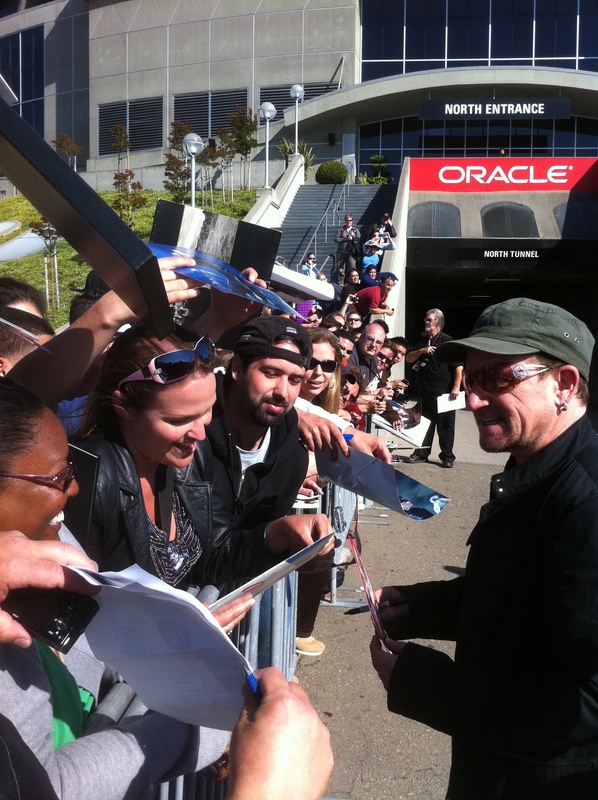 Please watch my video talking with Bono in Oakland. 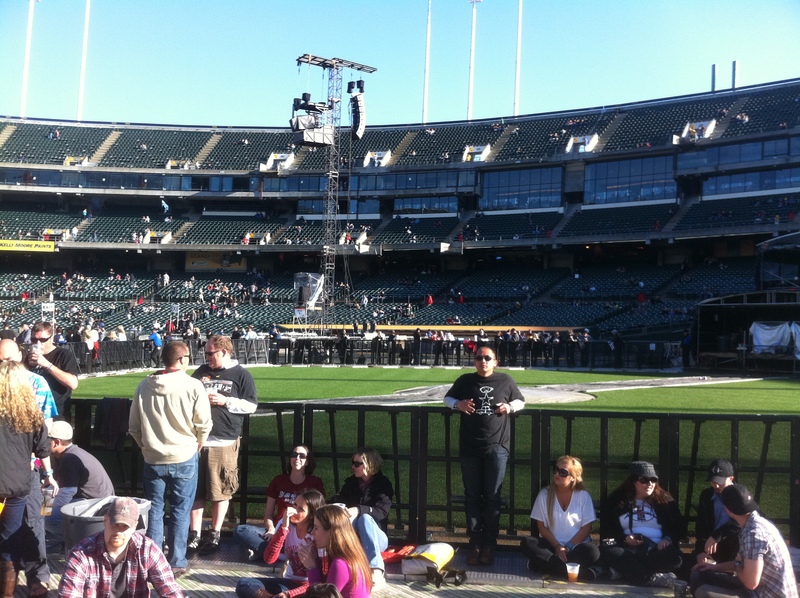 I went into the Coliseum in Oakland after 6pm and still got into the inner circle. It was a strange set up though. The baseball infield was fenced off, so the GA section was a lot smaller. And the back of the inner circle behind the stage where I usually stand was a bit narrower as well. Also, there was a wall of sky boxes behind the stage, which made for an echoing drum sound. Because the GA was smaller, the inner circle was more crowded. It was a very laid back crowd and very cold and windy that night. There were two opening bands for U2 in Oakland. Local band Moonalice played from 7:00 to 7:30. I was not impressed. The sound was bad and just not my cup of tea. Lenny Kravitz played from about 7:50 to 8:30. It was the same set list as Seattle. Lenny puts on a really great show. 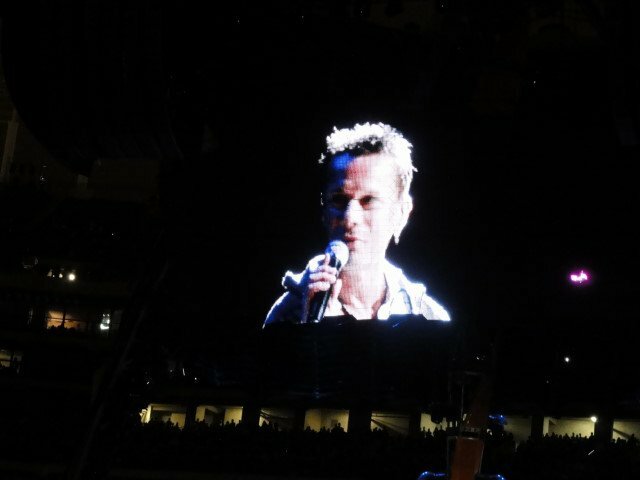 I waited for U2 to enter the Coliseum. They were going to enter from directly behind the stage rather than come around from the side, so I could get great video and pictures of their entrance. As they walked to the stage, Larry looked at me and smiled and waved – and I was actually able to capture it on video! The set list in Oakland was the same as the previous three shows in the US with one notable exception (and for me the highlight of the show) – Larry sang a part of Lou Reed’s Perfect Day. There were no band introductions at the Oakland show. Instead, Bono talked about the G3 Summit the night before with Greenday and Metallica and the possibility of doing a music festival with them. Edge spoke a bit about it and then Bono asked Larry what else was discussed. Larry said, “What goes on at that summit, stays at that summit.” Bono then asked Larry if any individuals names came up. Larry responded, “Lou Reed perhaps” and sang a bit of Lou Reed’s Perfect Day, then concluded by saying, “Lou, we love you man.” Lou Reed was at the show. I couldn’t believe Larry sang! I was SO excited! I haven’t seen Larry sing in concert since ZooTv! The set list for U2 360 in Oakland was as follows: Even Better Than The Real Thing, I Will Follow, Get On Your Boots, Magnificent, Mysterious Ways, Elevation, Until the End of the World / Anthem / Where Have All The Flowers Gone, Perfect Day / Happy Birthday, All I Want Is You, Stay, Beautiful Day / Space Oddity, Pride, Miss Sarajevo, Zooropa, City of Blinding Lights, Vertigo, I’ll Go Crazy / Discotheque / Life During Wartime / Psycho Killer, Sunday Bloody Sunday, Scarlet, Walk On, One, Will You Love Me Tomorrow – Where the Streets Have No Name, Hold Me Thrill Me Kiss Me Kill Me, With or Without You, Moment of Surrender. 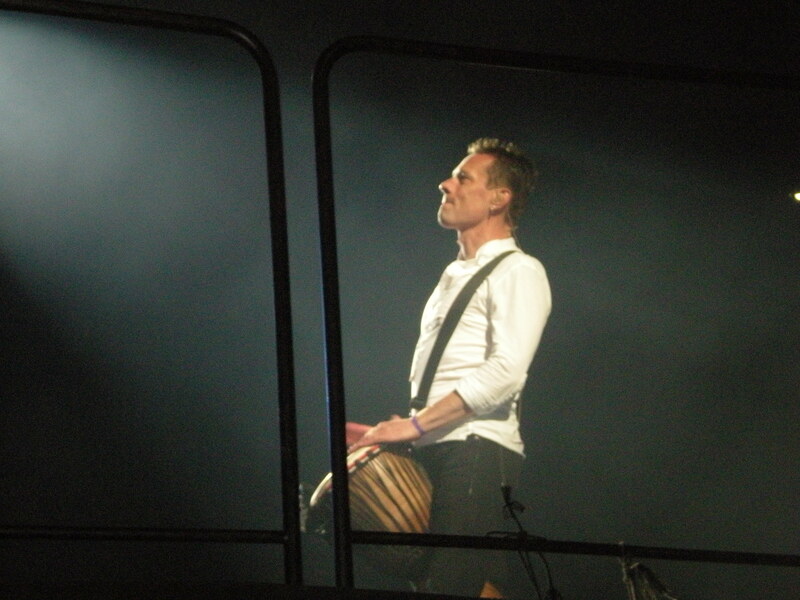 Please watch my video of an overview of the U2 360 show in Oakland 6.7.11. The day after the U2 show in Oakland, I just stayed in my hotel room napping, reading, watching tv and relaxing. Luckily I had enough leftovers (pizza of course), so I didn’t have to go out for food – just to walk the dogs. My hotel here is nice because it has free breakfast, free shuttle to and from the concert, and they delivered a microwave and refrigerator, but the walls are very thin. Every time someone shuts a door or is talking in the hall, my dogs bark – even at 4am while I’m sleeping. So I didn’t sleep much in Oakland. 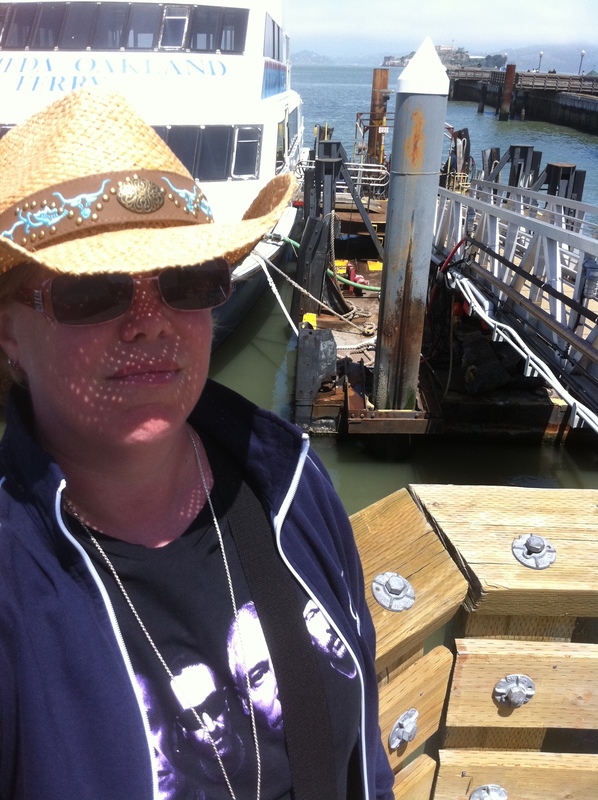 The next day I drove to Jack London Square in Oakland and took the 9:15am ferry to Fisherman’s Wharf in San Francisco. Unfortunately, there were about four large groups of children on field trips on the ferry and it was cloudy and cold when I arrived in San Francsico. Of course it was warming up and sunny as I was leaving to return back to Oakland. 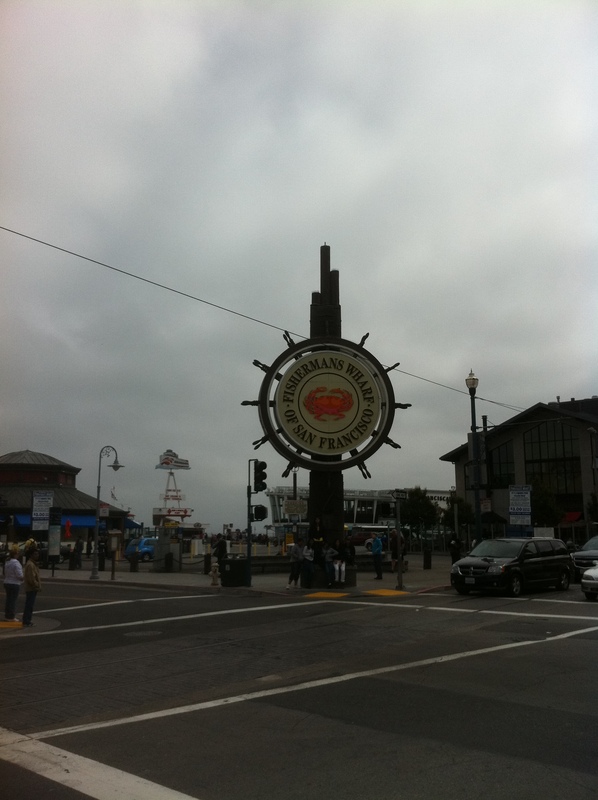 I spent my time in San Francisco at Fisherman’s Wharf, walking up and down and all around. 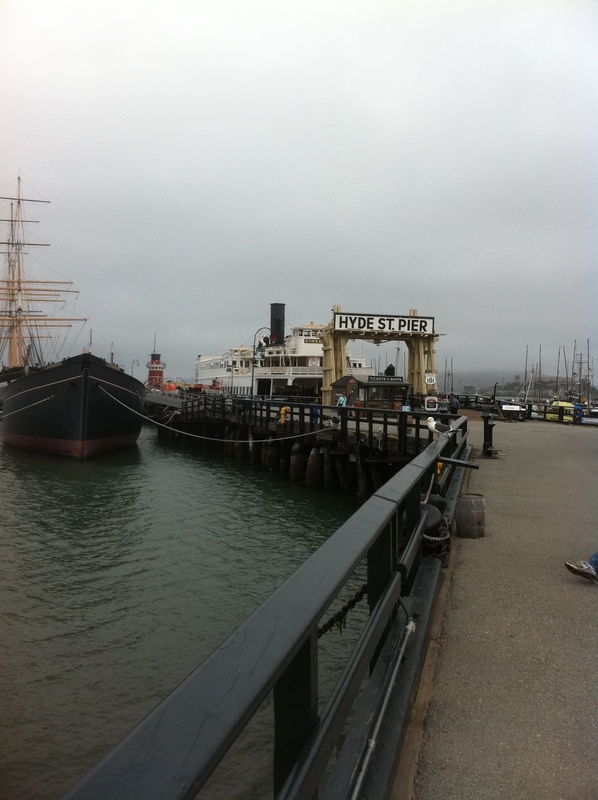 I looked at the historical ships on Hyde Street Pier and had lunch at historic Boudin’s (sourdough since 1849). 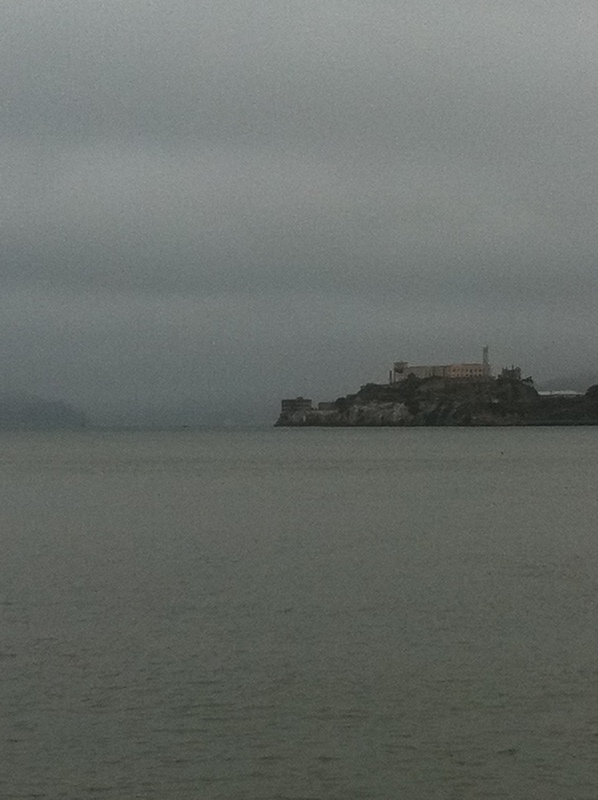 I could barely see the Golden Gate Bridge through the fog, but I could see Alcatraz and some good views of the San Francisco skyline and hilly streets. 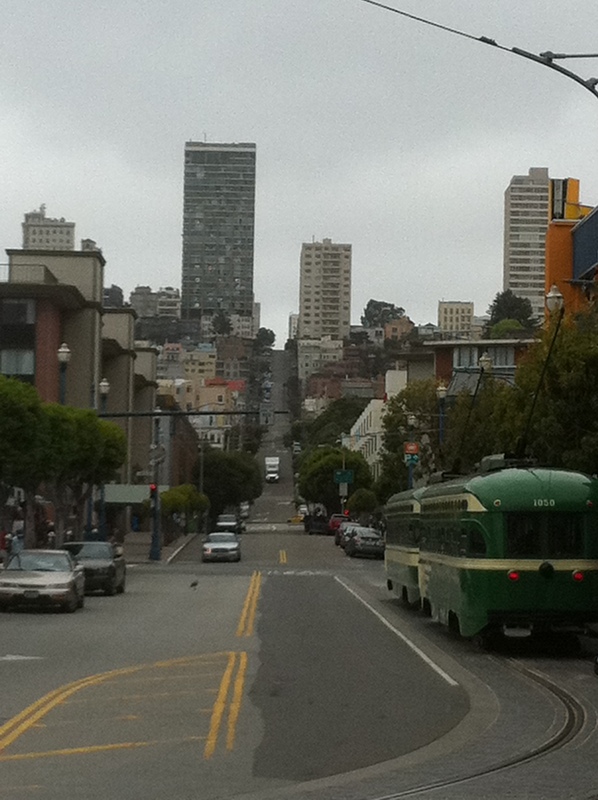 Luckily, I had been to San Francisco before, so I’ve seen all the sights. Please watch my video of Day 27 in San Francisco.